It's been hard to separate sports and politics lately. President Trump bickered with the NFL over anthem protests last year, ESPN's Jemele Hill called President Trump a "white supremacist," and now we have a baseball expert weighing in on the secretary of education. Peter Gammons, a Major League Baseball analyst who used to work for ESPN, is spouting some insensitive remarks about Trump's Education Secretary Betsy DeVos after her latest CBS interview. In her conversation with "60 Minutes" anchor Leslie Stahl, DeVos responded to the consistent criticism she's endured since her confirmation hearing. The secretary has been heckled at campuses across the country for her take on school choice, Title IX reform, etc. For insisting on more due process for students accused of sexual abuse, she was accused of "protecting rapists." She's "more misunderstood than anything," DeVos told Stahl. Will any disciplinary action be taken for Gammons's shamefully sexist comments? Will feminists stick up for her? 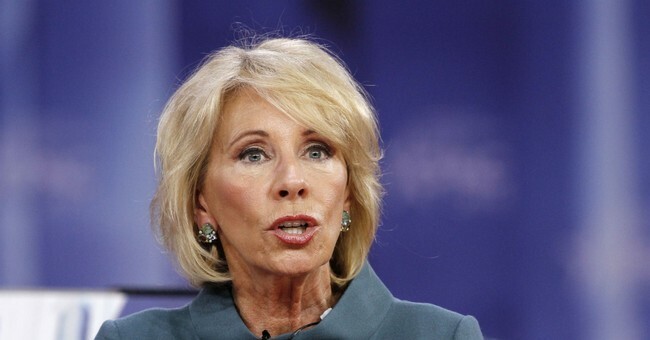 The verbal abuse continued last week, when DeVos visited Marjory Stoneman Douglas High School in Parkland, Florida, in an effort to extend some comfort to the students who have been traumatized by the deadly shooting on Valentine's Day, when 17 of their classmates and school faculty were slaughtered. She was not welcome by several students. One young woman told her "literally no one" had asked her to come. DeVos also finds herself in the middle of a debate not typically comes across the education secretary's desk: gun control. She spoke for the administration in noting that arming teachers is something that should at least be "considered" in the wake of the Parkland shooting. It's a difficult topic that won't be solved with easy answers. Two things that won't offer any solutions are name calling and sexism. Parting note on Gammons's tweet: The least he could do is spell her name right.